Data recall is windows-based application that will easily and securely store of all of your critical data. 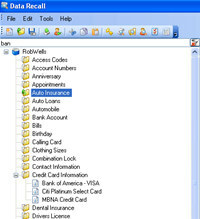 Data recall allows you to store an unlimited number of user names, passwords, web site url s, insurance policies, bank accounts, and much more. Data recall automatically sets up over 40 pre-defined categories, and their related fields. Data Recall - Free Alternative to Info Keep is a security program that works under windows xp, . It is Free so you can download it and share it with your friends. Estimated download time for Data Recall - Free Alternative to Info Keep on a common adsl connection is less than a minute. Version 1.0 was released four thousand eight hundred thirty six days ago by Ignyte Software. Click the green download button to download it now.